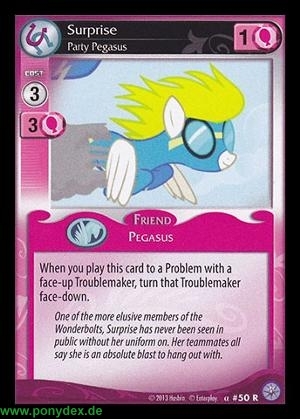 When you play this card to a Problem with a face-up Troublemaker, turn that Troublemaker face-down. One of the more elusive members of the Wonderbolts, Surprise has never been seen in public without her uniform on. Her teammates all say she is a blast to hang out with.